Pink eye is also known as madras eye and conjunctivitis (which is the proper medical term). Conjunctivitis causes the conjunctiva (the white outer layer of your eye and the inside of your eyelids) to become red, sore, painful and itchy. The cause of conjunctivitis is usual caused by a bacterial or viral infection or allergic reaction. 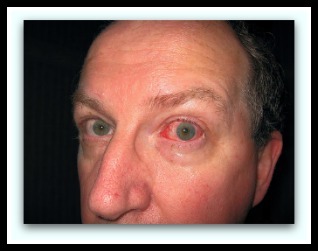 If the bacterial infection is the cause, then your eye may release yellow/white pus. This pus can glue your eyelids together, particularly after sleep. If the cause is an allergen your eyes can become itchy, swollen and produce a watery thin discharge. One of the easiest home remedies for pink eye is a hot and cold compress. A warm compress can help your eye and stops crust building up on your lashes. A warm compress will also help kill off the bacterium that creates conjunctivitis. Tea bags are an effective and easy compress to make. Simply boil some tea bags then let them cool off a little, until they are lukewarm then place them of the affected area. If you use a herbal tea bag such as chamomile or red raspberry leaf tea you have the added benefit of taking in the nice aroma from the teabags which can help relax you. Potatoes are useful for reducing swelling, simply slice a piece of potato and put it over your infected eye. Alternatively put one tablespoon of crushed nasturtium seeds with one tablespoon of grated potato over the eye. Improve your nutrition to cure and prevent conjunctivitis. Avoid foods that are high in starch and sugar content such as sweets, white bread, refined cereals and puddings. Also stay clear of condiments and spices. Eat yellow fruit like papayas and mangoes and green leafy vegetables such as spinach and broccoli. Milk, almonds, tomatoes and yoghurt also help conjunctivitis; they have high doses of vitamin B2 and vitamin A.